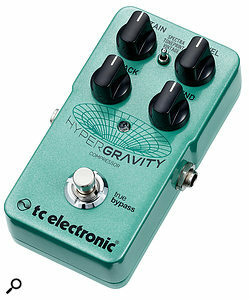 TC’s HyperGravity compressor pedal is unapologetically digital and is based on the algorithms developed for TC’s high-end System 6000 platform, so it’s able to offer multi-band compression as well as more conventional single-band compression. As with all the digital TC pedals in the same series, the HyperGravity is TonePrint enabled, which means there’s space to load one custom setup or to create your own using the free TonePrint editing software. There’s also the option to use the TonePrint app on your phone to transmit new compression presets to the pedal’s TonePrint slot just by holding your phone over the pickups of your guitar. Before looking at the pedal in more detail, it’s worth exploring the benefits of multi-band compression. In this design, the highs, mids and lows are compressed separately, the main advantage being that the highs don’t get sucked down whenever a low note triggers the compressor. In general this results in a more transparent compression that doesn’t change the basic tonal balance too much, even at higher compression levels. Then again, that full-on squash is sometimes just what you need — and, happily, that’s available too. Enjoying the same compact form factor and tough die-cast case as most others in the series, the pedal has true bypass with an LED showing when the compressor is active. Power comes from either an optional 9V DC supply or a battery (given the 100mA current draw a PSU would be the better option where possible). A mini USB socket and included cable allows connection to a computer for TonePrint editing. There are four control knobs and a mini three-way toggle switch, the latter selecting Spectra (multi-band), TonePrint or Vintage characters. By default, the TonePrint slot comes loaded with something that sounds like a halfway house between multi-band and classic, but using the editor software you can change the function of the knobs, apply auto-gain makeup, adjust the ratios, or make the blend control work only on specific frequency bands. You can also adjust the crossover frequencies between the three bands, change the compression curve, and set different thresholds for the three bands. The main controls comprise the usual Sustain (amount of compression), Attack and output Level, with a further knob labelled Blend that allows some dry sound to be mixed in to set up parallel compression. As explained, the knob functions may be different when using the TonePrint setting. While conventional compression affects the signal peaks in a very obvious way, parallel compression keeps the dynamic energy of the peaks while also bringing out the sustain. These few controls access a wide range of compression characters. The Attack control determines how percussive your note attacks sound; the longer the attack time, the more of the original peak gets through before gain reduction is applied, giving the classic country-music ‘snap’. If you simply want more sustain and a bigger sound without the compression becoming too obvious, then the multi-band option with a little dry sound dialled in does a great job. This is very flattering and is the sort of compression you could leave on all the time. The most obvious ‘compression as an effect’ comes with the Vintage mode at higher Sustain settings, so even if you don’t explore other TonePrint options, you’ll still find all the bases pretty much covered. Best of all, the HyperGravity really does have a very analogue feel to it, firmly dispelling the notion that digital compressors aren’t up to the job. And, given that the HyperGravity costs a lot less than many one-trick boutique compressors, I’d definitely recommend you try one.